As mobile devices become more and more a part of your customer’s daily life, now is the time to evaluate how your small business website displays on tablets, smart phones, and even computers. 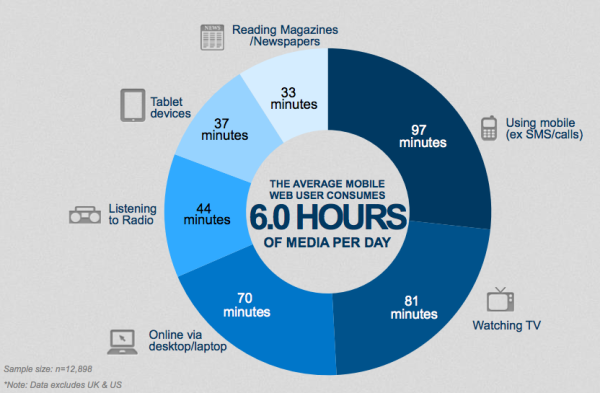 Recent reports have shown that smart phone and tablet usage combined to account for 60% of total digital media time. This means that your customers are using their desktop computers or laptops less frequently than their tablet or smartphone to view your website. Sure, you know what your website looks like on a computer, but do you know what your website looks like when viewing it on a tablet? Smartphone? Go ahead, grab your tablet or smartphone if you are not already on it and pull up your website. If you are reading this on a computer and don’t have a tablet or smartphone within reach, there are websites that can show you what a website looks like in various mobile devices. How does it look? Do you find yourself having to scroll horizontally? Are you zooming in to read the text? If you answered yes to any of these, I’m sure you are sharing the same pain as your customers. If your customers are cringing when visiting your site on a mobile device, do you think they are going to stay on your site? Or are they going to click the back button and find your competitor? Aside from your website providing a poor user experience, let’s take a look at why it makes business sense for your company website to utilize a responsive website design. Today’s saavy mobile user knows they have options. 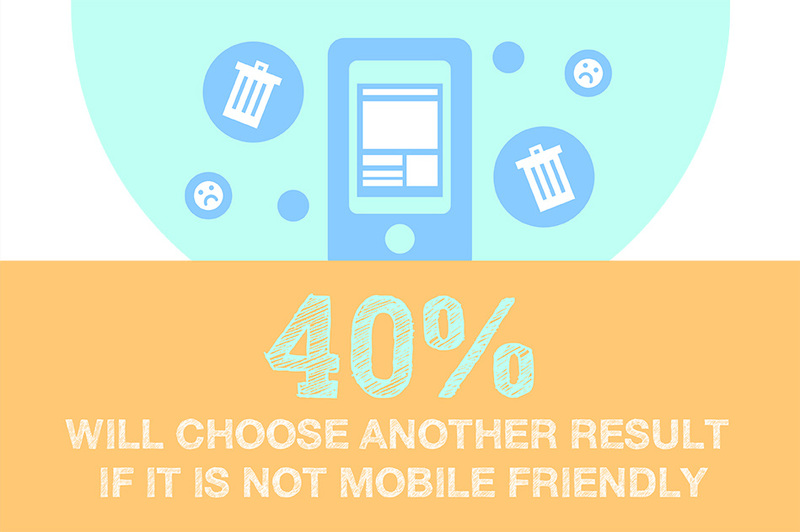 In fact, 40% of users will choose another result if a website is not mobile friendly. This is critical to the success of your small business online in the coming years. While Google may have over 200 factors that help determine your organic web rankings, reduced time on site, pages viewed and increased bounce rate are believed to negatively impact your search engine rankings. If your website is not mobile friendly, chances are that your site is sending these negative signals to Google which can ultimately harm your organic rankings. In a world once dominated by desktops (and later laptops), today’s user now spends over half their time online through the use of a mobile device. This trend is expected to continue in the coming years as the cost of tablets and smart phones continue to decrease making it affordable for more of the population. Pair this with more public wi-fi hot spots and you can see why we are on the cusp of mobile internet usage completely dominating desktops. 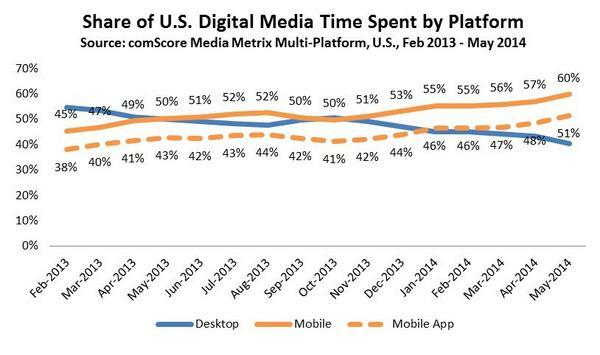 With the increase of time spent on mobile devices, businesses are looking to increase their exposure to those users. In 2015, mobile ad spending is expected to increase over 45% to over $45 billion dollars. Of this growth, Google and Facebook both saw their 2013 mobile revenue increase by almost $7 billion dollars. With the aforementioned affordability of mobile devices and availability of wi-fi, Ericsson is anticipating a 10X growth in mobile data traffic by 2019. An increase of growth this staggering further confirms that your small business must take advantage of mobile users through a responsive website design. In fact, by being proactive chances are that your company can be a step ahead of your competitors. If you are taking a wait and see approach, your competition can very well get the head start and leave your business playing catch up in the years to come. As mentioned above, having a responsive website may help with your search engine rankings. 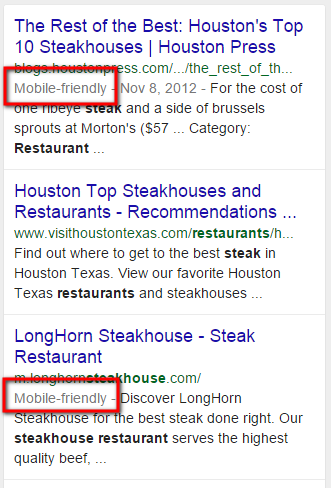 Did you know Google is starting to note which websites are mobile friendly? Imagine you are on a mobile device and are searching for something. You are skimming the results and notice a result or two indicate they are “mobile friendly”. If you are like me, I’d be more inclined to click on one of the mobile friendly results knowing that I shouldn’t be frustrated with the user experience on a mobile device. In fact, Google recently announced that this will be a factor that effects the organic ranking of websites. By converting your existing website design to a responsive layout, it provides you with an ideal opportunity to reduce the time it takes your website to load. Google states that your above the fold content should load in less than one second. In the image below, Google illustrates the load times that affect the loading of a page. Also, according to their research, any delay longer than one second may interrupt their flow of thought resulting in a poor user experience. According to a post that appeared on the Huffington Post, 85 percent of adults believe that a mobile site must be as good, if not better than, a desktop site. Think about it. Almost 9 out of 10 adults are expecting that the mobile experience on your website needs to be on par with the desktop experience. Does your website deliver on this? If not, where does your business website fall short? The proof is in the data. Having a responsive business website makes business sense. In the digital world, things move fast. No longer can companies who wish to succeed online be stagnant with decision making. Your company has to be proactive in its approach to provide customers the best experience possible. Rest assured if they don’t get that experience from you, I’m sure one of your competitors will be willing to. Don’t wait until all of your competitors have implemented a responsive website design. Have your small business on the forefront of responsive and not only provide a great experience, but also benefit with better organic rankings, more mobile traffic, and ultimately more revenue. We’re here to help you. Let’s talk about implementing a responsive design for your website.